For one to be able to play more than one position in American football and play them perfectly well, it takes more than doing and working just as hard as the average player does. For Desean Jackson, he has not only proven his versatility on the gridiron but has also shown convincingly how prolific he is at whichever part of the field he is on. Desean man’s the position of the wide receiver and kicks returner perfectly and has shown his athletic prowess in most of his games. It is no surprise that he holds the record as the first NFL player to be selected to a Pro Bowl for two separate positions. Originally drafted by the Philadelphia Eagles in the second round of the 2008 National Football League (NFL) draft, he shattered a lot of records with the team before joining the Washington Redskins in 2014 and the Tampa Bay Buccaneers in 2017. Born as the third out of five children to Gayle and Bill Jackson on the 1st of December 1986 in Los Angeles. He has two elder brothers – Byron and William, two younger brothers – Desmond, and Derrick and a sister – A’Dreea. Desean is not the only shining armor the family has when it comes to playing football as a career, his brother, Bryon, has also done well for himself in the game. He played as a wide receiver for San Jose State. Unfortunately, the Jackson’s lost the patriarch of their home on the 14th of May 2009 to pancreatic cancer. As a scholar, Desean Jackson attended Long Beach Polytechnic High school. There, he was proactive in various sports especially in the game of football where he played as a wide receiver. As a senior, he led his school team to victory in the CIF Southern Section Championship with a record of 15 touchdowns in 1, 075 yards and 60 passes. He also participated in the United States All-American Bowl and graced his audience with an incredible count of 7 passes, rushed 145 yards and a touchdown at 45 yards. Having set one of the best records in high school, Desean Jackson got several offers from different institutions to further his education. He finally settled for the University of California Berkeley. As a freshman, the young footballer started his year in high spirits and recorded 2 touchdowns. By the end of the season, he totaled 7 touchdowns and 38 receptions in 601 yards. During his sophomore year, he performed way better than his previous year and totaled 9 touchdowns in addition to 1, 060 receiving yards throughout that season. With such a performance, he bagged a lot of achievements including being the nation’s top runner for the Randy Moss Award to mention a few. By his junior year, he was awarded the Heisman Trophy and led his team to victory in Autzen Stadium as he recorded 11 passes for 161 yards with 2 touchdowns; a record which hasn’t be set since 1987 by the school team. Picking up an injury is no surprise for any footballer because it is quite inevitable, for Desean, he missed out a few games because of this. The following season, Desean went against team rules for which reason he was placed off the active roster making him miss more games including the Armed Forces Bowl First Quater. Nevertheless, he held Pac-10 records punt for both seasons and was ranked the third all-time at California for receiving yards with 2, 423 and receiving touchdowns of 22. He topped as the sixth position in receptions (162) and completed with 52 career plays of 20 yards or more, making up 23 percent of his 226 touches. Desean decided to forgo the remaining years of his collegiate career and declared his intentions of joining the National Football League. The Philadephia Eagles gave him the honors of joining the league as he was selected in the second round as the 49th overall in the 2008 NFL draft. He played for the team for three years before moving to join the Washington Redskins, he showed his athletic stints with the team for a period of two years and is currently proving his worth with the Tampa Bay Buccaneers. American footballers are one of the highest paid class of athletes in the world. Often times, the big boys pocket millions of dollars annually aside from what some of then earn from brand endorsements, product sponsorships and adverts. For DeSean Jackson, his is no different as he pockets a salary of $8 million annually and is estimated to be worth $30 million. Who is the Wife or Girlfriend of Desean Jackson? Desean Jackson has been in a lot of relationships. He was linked to a model named Chantel Jeffries in 2013. His relationship with Chantel didn’t last through the years because he was allegedly said to have cheated on the model with Brooke Bailey – a TV host. Like his first, his relationship with Brooke wasn’t going to last for a long time. 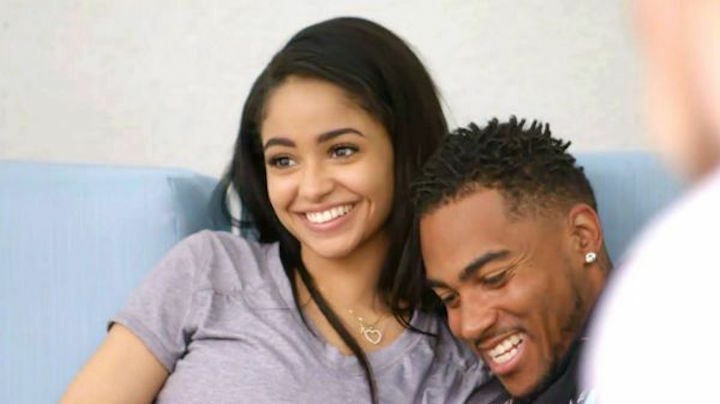 He moved on with Kayla Phillips, an Instagram personality and model. Desean has stayed put with her and together, they have played perfect parental roles for their three children. However, the couple just has one biological child together, the other two are from their previous relationships. Desean Jackson’s body size and height almost prevented him from joining the big league (NFL). He was said to have been petite and very small in size. He weighed 77kg and stood at 5 feet 9¾ inches. Currently, he has added a few inches to his height and still maintained his weight. He stands at 5 feet 11 inches. Irrespective of this, the footballer’s body measurement has not limited his performances in the field, it is unarguable that he is one of the best wide receivers who have an average height.